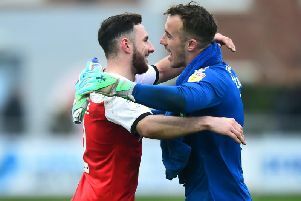 Eleven players have left Fleetwood Town on a permanent or temporary basis this month and now Joey Barton is keen for some arrivals before the transfer window closes on Thursday. Defender Gethin Jones and forward Conor McAleny were loaned out on Monday, while goalkeeper Matty Urwin left the club. Only two additions to the squad have so far been made this month, with Jack Sowerby following Ash Nadesan in returning from a loan spell at Carlisle United. Forward Harvey Saunders has also signed from National League North but was immediately loaned back to Darlington for the rest of the season. Striker Nadesan netted nine times for the Cumbrians and went straight into Barton’s team, starting the last four games. Midfielder Sowerby has returned this week, having scored five times in 28 appearances for the Cumbrians since August, and comes into contention for Saturday’s home clash with Charlton Athletic. McAleny has joined Scottish Premiership club Kilmarnock for the rest of the season. The 26-year-old has managed just 19 appearances in an injury-hit season, scoring his only goal against Leicester City Under-21 in the Checkatrade Trophy, and has fallen down the pecking order at Town. He is under contract at Highbury until the end of next season. Jones, 23, has linked up with League Two Mansfield Town for the rest of the campaign. The full-back joined Town from Everton 12 months ago but has found game-time hard to come by due to the form of Leeds loanee Lewie Coyle. He has made only eight appearances all season, five of them in cup games. Jones last played in the Checkatrade Trophy defeat at Bury in November and has since spent time training with Town’s Under-18s. Keeper Urwin, 25, has moved to Chorley on a permanent basis after spending the first half of this season and all of last on loan at Victory Park. Signed from AFC Fylde in summer 2016, he never made a senior appearance for Town. Cian Bolger (Lincoln City), Bobby Grant (Wrexham) and Chris Long (Blackpool) have left the club since the turn of the year, while Kyle Dempsey (Peterborough United) and Lewis Baines (Stockport County) have been loaned out. Michael Donohue’s contract was terminated and Tommy Spurr returned to Preston early, leaving Barton with a loan spot available. Speaking before yesterday’s three departures, the Town boss said: “I think we need a couple more out. I think we need a couple in just to freshen it back up. “There are a couple who would benefit from having a go somewhere else. They are aware of that . “Also we have identified players but we are playing that game of cat and mouse because at this time of year it is difficult to do deals. “Whether we have the finances to do it I’m not sure. “All I can do is identify. If it was my money I’d be able to give you guarantees but unfortunately it is not. “Everyone is working hard.If we get what we need, then great. It will stand us in good stead for the future. “I’d rather do more permanent deals than loans because you want to start bedding in a team that is capable of getting out of the division. Barton is already looking ahead to next season and added: “It is hard to talk about other people’s players but ideally I’d bring three or four in. “I’ve identified what I think we need, but what you want and what you get in the business are not entirely connected. “It might be that we have to batten down the hatches and get to the May, June, July to try and put together a team capable of getting out of this division. “Do I think that is possible? Without a shadow of a doubt. The Central League Cup semi-final between Town’s Development Squad and Notts County scheduled for Poolfoot Farm this afternoon has been postponed.